To see a PDF with photographs from the symposium, click here. This daylong symposium on the Makino Collection examined research in the field of Japanese film studies emerging from the rich holdings of the Collection. Renowned scholars in Japanese film studies discussed their research and use of the Makino Collection, as well as potential future research opportunities it affords. Scholars in Chinese and Korean film studies and from the Film Division in the School of the Arts also discussed the cross-regional opportunities for research using the Makino Collection. YouTube and Academic Commons (Columbia's Open Access forum)! To browse presentations on YouTube, click here. To browse presentations on Academic Commons, click here. To search presentations by presenter name on Academic Commons, click here and type in name. 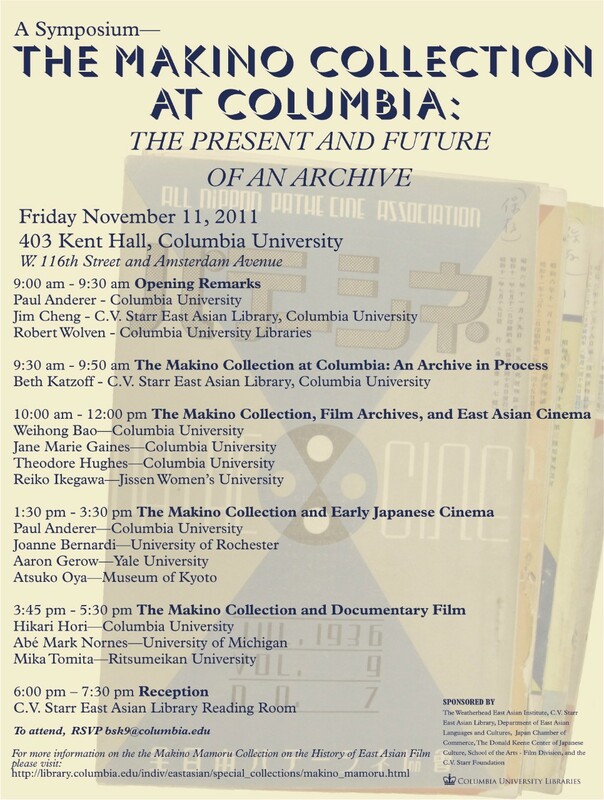 9:30am-9:50am: "The Makino Collection at Columbia: an Archive in Process"
10:00am-12:00pm: "The Makino Collection, Film Archives, and East Asian Cinema"
"Pudovkin’s Fellow Travelers: The Introduction of Montage to China"
"Archive Phobia: Korean Cinema and its Colonial Pasts"
"Japanese Female Director Sakane Tazuko, the Manchurian Film Association, and Archival Materials for Japanese Colonial Films"
1:30pm-3:30pm: "The Makino Collection and Early Japanese Cinema"
"Destination Japan: The Personal Collection as Alternative Archive"
"Makino Mamoru and Film Theory: The Case of Nakagawa Shigeaki"
"Onoe Matsunosuke and Materials Related to the Film, Chushingura (The Royal Forty-seven Ronin) in the Makino Mamoru Collection"
3:45pm-5:30pm: "The Makino Collection and Documentary Film"
"Paul Rotha/Pōru Rūta and the Politics of Translation"
"Aspects of Small-Gauge Film Culture in Prewar Japan"
The symposium was open to the public. The symposium was sponsored by The Weatherhead East Asian Institute, the J.C.C. Fund of the Japanese Chamber of Commerce and Industry of New York, the Department of East Asian Languages and Cultures, the C.V. Starr Foundation, C.V. Starr East Asian Library, the Donald Keene Center of Japanese Culture, and the School of the Arts–Film Division. An exhibition of selections from the Makino Collection was held in the C.V. Starr East Asian Library reading room.